My birthday is in March, and I always associate this time of year with irises, because the irises around our house would start to bloom in time for my birthday. 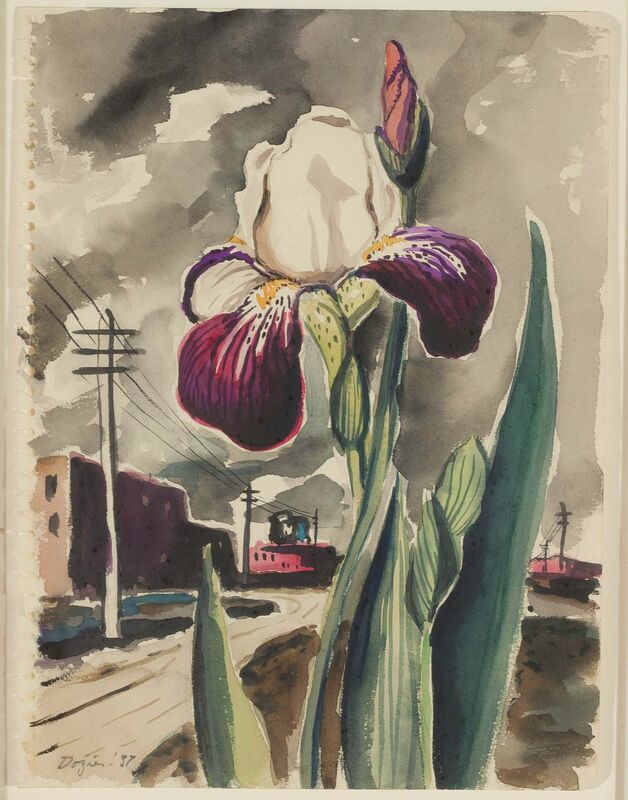 There’s no better way to celebrate a (belated) start to Spring than by sharing this beautiful watercolor from Otis Dozier: “Iris (purple) April,” 1937. This watercolor is in the collection of the Dallas Museum of Art, a gift of The Dozier Foundation; ©Denni Davis Washburn, William Robert Miegel, Jr., and Elizabeth Marie Miegel. More information is here. More on the Forney-born Dallas Nine artist Otis Dozier (1904-1987), here. Did you know there is an Iris Society of Dallas? There is! Click picture for very large image. I remember blue-ish ones, but my favorites are the purple ones and the white ones. Travis County’s first iris of the year showed up on February 15 and was more blue than purple. That’s clearly in advance of north Texas, but then here in the subtropics red buds put in an earlier appearance too.